William Hartnell, the actor who was the original Dr Who in the BBC television series, died yesterday in hospital near his home in Marden, Kent. He was 67 and had been ill for about three years. He created the Dr Who role in 1963, and in, spite of predictions that the programme would run only six weeks he kept the part for three years. Three other actors have since played the part. "Billy" Hartnell, as he, used to be known, began his career in 1924, went into films in 1931 —his first was The Man I Killed—and had his first London stage part the next year. During the Second World War he was invalided out the Royal Tank Corps. Then in 1944 fame came with the role of Sergeant Fletcher in The Way Ahead, recently revived on BBC-1. A string of hard-nosed characters followed—NCOs, foremen, criminals. His many films included-- Brighton Rock, Temptation Harbour, and This Sporting Life. His first success in television was as Sergeant-Major Bullimore in the ITV comedy series The Army Game. Mr Hartnell is survived by his wife, Heather McIntyre, a former actress and playwright, and a daughter, Anne. APA 6th ed. : (1975-04-25). William Hartnell obituary (The Guardian). The Guardian . MLA 7th ed. 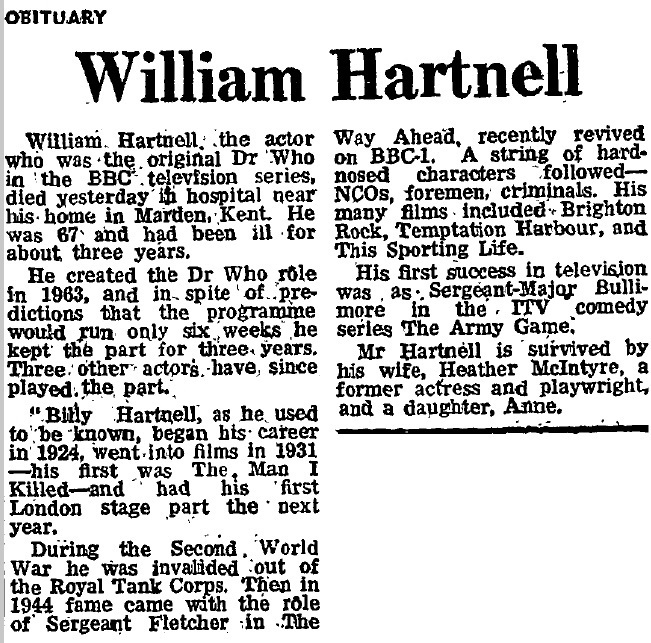 : "William Hartnell obituary (The Guardian)." The Guardian [add city] 1975-04-25. Print. Turabian: "William Hartnell obituary (The Guardian)." The Guardian, 1975-04-25, section, edition. This page was last modified on 21 July 2014, at 22:32.